3 Palestinian civilians, including a boy and a girl, were killed by the Israeli forces and settlers in the West Bank. The girl was killed at a military checkpoint, claiming that she attempted to carry out a stabbing attack. 24 civilians, including a child, were wounded. A Palestinian civilian was killed and another one succumbed to his wounds. 146 civilians, including 38 children, 4 women, a journalist, and 6 paramedics, were wounded. 2 Palestinian civilians were wounded in northern and southern the Gaza Strip. Israeli forces conducted 72 incursions into Palestinian communities in the West Bank. 61 civilians, including 7 children, were arrested. 2 Palestinian civilians, from al-Showkah village, east of Rafah, south of the Gaza Strip, were arrested while attempting to sneak into Israel. A building and 2 residential houses were demolished. 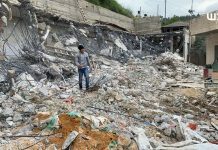 A civilian was forced to self-demolish parts of his house in Wadi al-Jouz and Silwan village. Israeli forces demolished an under-construction house southern Nablus, and confiscated 2 barracks, southeast of Bethlehem. Israeli settlers carried out 6 attacks. As a result, a civilian sustained bruises and 8 vehicles sustained damages. 9 shooting incidents were reported against the fishing boats in the sea. 103 permanent checkpoints, 108 temporary checkpoints and 14 closed roads obstruct the movement of Palestinian civilians in the West Bank. 3 civilians were arrested at the military checkpoints in the West Bank. Israeli violations of international law and international humanitarian law in the oPt continued during the reporting period (24-30 January 2019). On 30 January 2019, in a new crime of excessive use of lethal force, Israeli forces killed a Palestinian girl at al-Za’eem military checkpoint, east of occupied East Jerusalem. According to PCHR’s investigations, at approximately 10:00, the Israeli forces stationed at al-Za’eem military checkpoint, east of occupied East Jerusalem, shot dead a Palestinian girl Samah Zuhair Mubarak (16), from Um al-Sharayet neighborhood, south of Ramallah. The Israeli forces alleged that Samah tried to carry out a stabbing attack. A video recording showed that the girl, at the time of the shooting, was wearing a niqab with nothing in her possession that shows an intention of an attack. Another video showed the girl lying on the ground and the Israeli forces searching her bag while there was a small knife next to her. Samah was in 11th grade studying in Ramallah School. PCHR’s investigations are still continued, noting that the Israeli forces are still keeping Samah’s body until the reporting period. At approximately 00:10, Israeli forces moved into ‘Azoun village, east of Qalqiliyia. They raided and searched 2 houses belonging to Obai Hamza Hussain and Yehia ‘Ali ‘Edwan and then arrested them. At approximately 01:00, Israeli forces moved into the southern area of Hebron and then stationed in Abu Sninah neighborhood. They raided and searched a house belonging to Naser Taleb Abu Sninah (20) and then arrested him. Around the same time, Israeli forces moved into Beit Fowreek village, east of Nablus. They raided and searched a house belonging to Yazan Mahmoud Naser Allah Hanani (29) and then arrested him. Around the same time, Israeli forces moved into Nahaleen village, west of Bethlehem. They raided and searched 2 houses belonging to Ammar Mohamed Khalil Shakarnah (18) and Fadi Rebhi Zidan (24) and then arrested both of them. Around the same time, Israeli forces stationed along the border fence with Israel, east of al-Shawkah village, east of Rafah, south of the Gaza Strip, arrested Ibrahim Riyad Ahmed ‘Abed al-‘Al (19) and Mahmoud Mohamed Mahmoud Abu Sanimah (23) while attempting to sneak into Israel. At approximately 02:0, Israeli forces moved into Sir village, north of Qalqiliyia. They raided and searched a house belonging to Mohamed Mahmoud Za’rour (17) and then arrested him. Around the same time, Israeli forces moved into Beit Ummer village, north of Hebron. They raided and searched a house belonging to Ahmed Mahmoud ‘Awad (28) and then arrested him. At approximately 03:30, Israeli forces moved into Jayyous village, northeast of Qalqiliyia. They raided and searched a house belonging to Mohamed ‘Abed al-Raheem Sleem (22) and then arrested him. At approximately 09:20, a group of Israeli undercover units “Mosta’rebin”, sneaked into the southern entrance to Tubas. They sneaked by a vehicle with Palestinian registration plate and then stationed in front of the village’s market. They raided Tubas Endowment (Awqaf) office, which is comprised of 5 story, and then arrested ‘Abed al-Qader ‘Ali Bani ‘Odah (40). It should be noted that ‘Abed al-Qader is from Tamoun village, southeast of the city, and works as the Head of the Mosques Section in Tubas. At approximately 23:05, Israeli gunboats stationed off al-Sodaniyia shore, west of Jabalia, north of the Gaza Strip, heavily opened fire at Palestinian fishing boats sailing within 4 nautical miles. The Israeli naval forces fired shells in the vicinity of the fishing boats and chased them. As a result, the fishermen fled for fear of their lives, and no injuries among them were reported. Note: During the aforementioned day, Israeli forces conducted (11) incursions in the following areas and no arrests were reported: Sabastiyia village, northwest of Nablus; ‘Anzah village, south of Jenin; al-Showika suburb and Tulkarm and Nour al-Shams camps in Tulkarm; Dirsitiyia village, northwest of Salfit; Beit Ola and Dir ‘Asal al-Foqa in Hebron; and Beit Sahour and Hosan villages in Bethlehem. At approximately 00:45, Israeli forces moved into Jenin refugee camp, west of Jenin. They raided and searched a house belonging to Suhaib Bassam al-Sa’dy (21) and then arrested him, taking him to unknown destination. In new crime of excessive use of force, Israeli forces killed at evening hours a Palestinian child in Selwad village, east of Ramallah. According to PCHR’s investigations, at approximately 16:30, around 15 Palestinian young men and children gathered adjacent to the settlement road No. (60), near Selwad village, northeast of Ramallah. The young men and children threw stones at the Israeli forces stationed beside a watchtower located in the area. At approximately 17:40, a number of them moved 30-50 meters towards the Israeli vehicles stationed on the street. In the meantime, an Israeli soldier immediately fired a live bullet, which resulted in the injury of Ayman Ahmed ‘Othman Hamed (16), who was wounded to the left side of the chest. The Israeli forces kept the wounded child in an Israeli ambulance before handing him as a dead body to a Palestinian ambulance, which took Ayman to Palestine Medical Complex in Ramallah. It should be mentioned that Ayman was a student at Selwad High School for Boys. Note: During the aforementioned day, Israeli forces conducted (10) incursions in the following areas and no arrests were reported: al-Showika suburb, Tulkarm Camp and Far’oun village in Tulkarm; Dir Balout and Yasouf villages in Salfit; Dura, Samou’a, Beit Ummer, and al-Sima villages in Hebron. At approximately 13:00, Israeli gunboats stationed in the sea, west of Khan Yunis, south of the Gaza Strip, opened fire at Palestinian fishing boats sailing within the allowed fishing area and chased them, causing fear and panic among Palestinian fishermen. As a result, the Palestinian fishermen fled for fear of their lives and no casualties or damages to the boats were reported. At approximately 13:15, Israeli gunboats stationed in the sea, west of Rafah, south of the Gaza Strip, opened fire at Palestinian fishing boats sailing within 3 nautical miles and chased them, causing fear and panic among Palestinian fishermen. As a result, the Palestinian fishermen fled for fear of their lives and no or damages to the boats casualties were reported. At approximately 22:50, Israeli gunboats stationed off al-Sodaniyia shore, west of Jabalia, north of the Gaza Strip, heavily opened fire at Palestinian fishing boats sailing within 4 nautical miles. The Israeli naval forces fired shells in the vicinity of the fishing boats and chased them. As a result, the fishermen fled for fear of their lives, and no injuries among them were reported. At approximately 23:05, Israeli gunboats stationed off al-Sodaniyia shore, west of Jabalia, northwest of Beit Lahia, north of the Gaza Strip, heavily opened fire at Palestinian fishing boats sailing within 3 to 4 nautical miles and chased them. As a result, the fishermen fled for fear of their lives, and no injuries among them were reported. Note: During the aforementioned day, Israeli forces conducted (3) incursions in the following areas and no arrests were reported: Ya’boud village, southwest of Jenin and Hawarah village, south of Nablus. At approximately 02:30, Israeli forces moved into al-Dhaisha refugee camp, south of Bethlehem. They raided and searched houses, from which they arrested Mohammed Jalal Abu Hedros (22), Sa’ed Mahmoud Abu Hedros (24) and Shadi abu Hedros. At approximately 02:40, Israeli forces moved into Tarmas’eia village, northeast of Ramallah. They raided and searched houses and shops, form which they arrested Mohammed Ahmed ‘Ali Abu ‘Owad (17) and Anas Majed ‘Abd al-Hafed (16), taking them to an unknown destination. Around the same time, Israeli forces moved into Ni’leen village, west of Ramallah. They raided and searched houses, from which they arrested Mo’taz Salah al-Khawaja (22) along with his brother Mohammed (20), Mohammed Hatem al-Khawaja (22), and Ibraheem Sa’ed Srour (19). At approximately 13:20, Israeli forces stationed off Khan Younis shore, south of the Gaza Strip, opened fire at Palestinian fishing boats sailing within the allowed fishing area and chased them, causing fear and panic among fishermen. As a result, the fishermen fled for fear of their lives, and no casualties among them or damages in their boats were reported. At approximately 14:30, Israeli forces moved into Sayda village, northeast of Tulkarem. They patrolled in the area amidst firing sound bombs and tear gas canisters at Palestinian civilians under the pretext of throwing stones. As a result, Ihab Murad Medhat ‘Ajaj (13) sustained a sound bomb shrapnel wound to the head. Note: During the aforementioned day, Israeli forces conducted (6) incursions in the following areas and no arrests were reported: Beit Amareen village, northwest of the city; and Dir ‘Asal, Beit al-Rosh and al-Moreq villages in Hebron. At approximately 01:00, Israeli forces moved into Jenin refugee camp, west of Jenin, raided and searched several houses, from which they arrested Thair Mer’ee (24), Qais ‘Adnan al-Goul (25), Saher Ibrahim Bani Gorra (22), Bahaa Jameel Rahhal (24), and Anas Abu Rayyan (19), taking them to an unknown destination. At approximately 01:30, Israeli forces moved into Beit Fajjar, south of Bethlehem, raided and searched several houses, from which they arrested Ahmad Nasser Thawabta (22), Ramy ‘Ali Toqtaqa (21) and Abul Latif Ahmad Thawabta (22). Around the same time, Israeli forces moved into al-Khader village, south of Bethlehem. They raided and searched a house belonging to Salah Rezeq Salah (20) in Kroum ‘Ashour area, south of the city. They then arrested him, taking him to an unknown destination. At approximately 02:00, Israeli forces moved into Tammun village, southeast of Tubas, raided and searched several houses, from which they arrested ‘Abdullah Jehad Tawfiq Bani ‘Odah (27), Adam ‘Abudl ‘Azeez al-Razeq Bani Mattar (32), and Mohammad ‘Abdul ‘Azeez Bsharat (26). At around the same time, Israeli forces moved into Tubas, where they raided and searched several houses. They then arrested ‘Alaa Yasser Durghamah (25) and Ihab Mohammad Rasheed Rurghamah (26), taking them to an unknown destination. At around the same time, Israeli forces backed by 3 military vehicles moved into al-Samou’a village, south of Hebron. They raided and searched a house belonging Eyad ‘Abul Khader Badreen (40) and then arrested him, taking him to an unknown destination. At approximately 04:40, Israeli forces moved into Kafur Ni’ma village, west of Ramallah. They raided and searched several houses, from which they arrested Ramzy Ribhee ‘Ataia (25), Nafez ‘Abdul ‘al-‘Aal ‘Abdullah (21) and Suliman Mohammad al-Deek (24), taking them to an unknown destination. Around the same time, Israeli forces moved into Senjil village, north of Ramallah. They raided and searched a house belonging to Mohammad Asfour and then arrested his 2 sons Hussien (27) and Suliman (21), taking them to an unknown destination. At approximately 16:30, a landmine, from the Israeli forces remnants, exploded in a herd of cows in al-Sakout area. The shepherd was tending his herd around 700 meters away of Om ‘Esheesh Brdige, near street 90 in Northern Jordan Valley. As a result, 4 cows belonging to Fawzi Yousif Mofdi Abu Motawe’ died. At approximately 16:30, Israeli forces stationed along the border fence with Israel, east of Khan Yunis, south of the Gaza Strip, opened fire at lands located in the east of ‘Abasan al Jadida village, east of Khan Yunis. 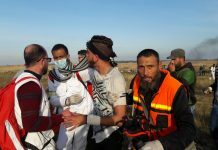 As a result, a 25-year-old male was hit with a live bullet to the right hand and was then taken to the European Gaza hospital, where doctors classified his wounds as minor. Note: During the aforementioned day, Israeli forces conducted (7) incursions in the following areas and no arrests were reported: Kafr Qaddum, northeast of Qalqilya; Beit Ummar and Surif villages in Hebron; Tulkarm; al-Balou’a neighborhood in al-Bireh, Beitin village, north of the city, and Beit Rima village, northwest of Ramallah. At approximately 01:00, Israeli forces moved into Kharsa village, south of Dura, southwest of Hebron. They raided and searched a house belonging to ‘Abed al-Majeed Ahmad Shadeed (36). They then handed him a notice to refer to the Israeli Intelligence in “Gush Etzion” settlement, south of Bethlehem, and later withdrew. At approximately 01:30, Israeli forces moved into Jenin, where they raided and searched several houses. They then arrested Mohammad ‘Ali Samoudi (24), a student at the Arab American University, and Ibrahim Khaled al-Salfeti (24), taking them to an unknown destination. Around the same time, Israeli forces moved into Jenin refugee camp, west of Jenin. They raided and searched a house belonging to Qossai Jamal Abu Khalifa (17), and then arrested him, taking him to an unknown destination. At approximately 02:00, Israeli forces moved into Kroum ‘Ashour area, south of Nablus. They raided and searched a house belonging to Yousif Ahmad Yousif ‘Awwad (20). They then arrested him, taking him to an unknown destination. Around the same time, Israeli forces moved into Selwad village, northeast of Ramallah. They raided and searched a house belonging to Mohammad ‘Abed al-Nasser Hamed (23), in Kroum ‘Ashour area, south of the city. They then arrested him, taking him to an unknown destination. At approximately 03:30, Israeli forces moved into Bal’a village, east of Tulkarm. They raided and searched 2 houses belonging to Mahdi Hassan al-Haj (25) and Ja’far Ayman Shahrour (23) and then arrested them, taking them to an unknown destination. At approximately 07:00, Israeli gunboats stationed off al-Sodaniyia shore, west of Jabalia, northwest of Beit Lahia, north of the Gaza Strip, heavily opened fire at Palestinian fishing boats sailing within 3 nautical miles and chased them, causing fear and panic among Palestinian fishermen. As a result, the Palestinian fishermen fled for fear of their lives and no casualties were reported. At approximately 10:00, Israeli forces backed by 3 military vehicles moved into Taqou’a village, southeast of Bethlehem. They surrounded Taqou’a High School, summoned its headmaster and threatened to close the school if throwing stones at the pedestrians of bypass road No. 60 continued. They later withdrew and no arrests or incursions were reported. 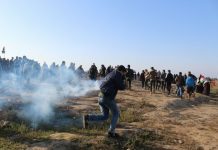 At approximately 12:30, Israeli forces stationed along the border fence with Israel, opened fire and threw tear gas canisters at the border area in al-Bourah area, north of Beit Lahia, north of the Gaza Strip. As a result, Ameen Mahmoud Darweesh Hamdona (44), from Beit Lahia, was hit with a live bullet to the neck. Ameen was wounded when he was working with a bulldozer, under the supervision of the Ministry of Finance, in transporting sand to trucks and was 300 meters away from the aforementioned border fence. Ameen was then taken to the Indonesian Hospital in Jabalia, where his wound was classified as serious. Moreover, doctors said that the bullet (enter and exit) caused laceration in the sixth vertebrae and injured the spinal column. As a result, he lost senses of his upper limbs. According to PCHR’s field investigations, Ameen and his brothers own several bulldozers and trucks to transfer and sell sand, under the supervisor of the Ministry of Finance. At the time of his injury, he was standing near his bulldozer. Note: During the aforementioned day, Israeli forces conducted (5) incursions in the following areas and no arrests were reported: Bani Na’im, Nuba, Kharas, al-Majd villages in Hebron; and al-Rashaida village in Bethlehem. At approximately 01:30, Israeli forces moved into ‘Araba, southwest of Jenin. They raided and searched several houses. They then arrested 3 civilians namely J’afar Ibrahim ‘Ez al-Deen (48), Mustafa Shehada Shebani (35) and Mohammad Baker Abu ‘Obaid (30), taking them to an unknown destination. Around the same time, Israeli forces moved into Qabatiya village, southeast of Jenin. They raided and searched several houses. They then arrested 2 civilians namely Yousuf Rashed Abu Khameer (38) and Naji Sameer Nazzal (28), taking them to an unknown destination. Around the same time, Israeli forces moved into Beit Ummar village, north of Hebron. They raided and searched a house belonging to Mahmoud Suliman Akhleel (26) and arrested him, taking him to an unknown destination. At approximately 02:00, Israeli forces moved into al-Karmel village, east of Yatta, south of Hebron. They raided and searched a house belonging to Mohammad Jibreel Salamah (40). They then arrested him, taking him to an unknown destination. At approximately 03:00, Israeli forces moved into Beit Furik village, east of Nablus. They raided and searched a house belonging to Ziad Hassan Mleitat (35) and then arrested them, taking them to an unknown destination. Around the same time, Israeli forces moved into al-‘Aroub refugee camp, north of Hebron. They raided and searched a house belonging to Maher Mohammad Abu Wardah (22). They later arrested him, taking him to an unknown destination. At approximately 02:40, Israeli forces moved into al-Jenan neighborhood, in the Central al-Bireh. The raided and searched a house belonging to Mahmoud ‘Ali al-Qadi (22). They later arrested him, taking him to an unknown destination. Around the same time, Israeli forces moved into Ramallah and stationed in Batn al-Hawa neighborhood. They raided and searched a house belonging to Laith Kan’aan al-Bargouthi (26). The later arrested him, taking him to an unknown destination. It should be noted that Latih was hit with a tear gas canister to the left eye resulting in its loss during confrontations at the northern entrance of al-Bireh around 2 years ago. At early morning, in a new crime of excessive use of lethal force, Israeli forces killed a Palestinian girl at al-Za’eem military checkpoint, east of occupied East Jerusalem. According to PCHR’s investigations, at approximately 10:00, the Israeli forces stationed at al-Za’eem military checkpoint, east of occupied East Jerusalem, shot dead a Palestinian girl Samah Zuhair Mubarak (16), from Um al-Sharayet neighborhood, south of Ramallah. The Israeli forces alleged that Samah tried to carry out a stabbing attack. A video recording showed that the girl, at the time of the shooting, was wearing a niqab with nothing in her possession that shows an intention of an attack. Another video showed the girl lying on the ground and the Israeli forces searching her bag while there was a small knife next to her. Samah was in 11th grade studying in Ramallah School. PCHR’s investigations are still continued, noting that the Israeli forces are still keeping Samah’s body until the reporting period. Note: During the aforementioned day, Israeli forces conducted (3) incursions in the following areas and no arrests were reported: al-Dhahiriya and Abu al-‘Asja villages in Hebron; and Sebastia village, northwest of Nablus.